On a PC, the IEEE port (called FireWire) is used primarily for connecting audio or video devices to the console. An external scanner or disk drive may also use the IEEE port. Plug any IEEE device into the computer at any time. The computer or the device can be on or off when you plug things in or remove them. Be sure to check with the device’s documentation for any exceptions to this plug-in-whenever rule. 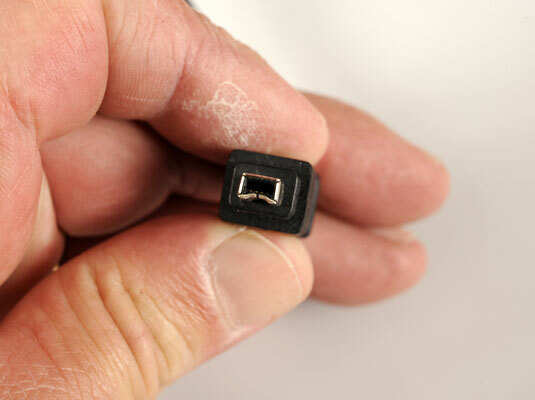 There are two types of IEEE connectors: regular and mini. The smaller, mini connector (shown in this figure) is used specifically with digital video and is often labeled DV. Be sure to look for one of these connectors in the secret panel on the front of the console (if the console has such a panel). IEEE devices require an IEEE cable, which may or may not come with the device.